Clippers will blunt very quickly if clipping dirty clients, wash or brush if possible to eliminate grit and dirt from the coat. A dirty animal coat can blunt even the sharpest clipper blade in a very short time. 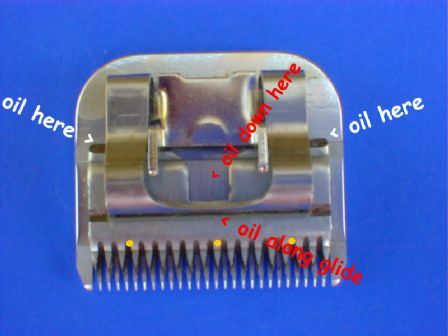 Oil the clippers during use. Dip in blade wash while running the clippers to wash or swill the blade teeth clean as you work if at all possible. This also cools the blades and helps to stop the oils from the animals coat forming into a hard glaze on the cutting edges of your blades and reducing their performance. In our and others opinion blade wash on it's own is good but is even better if a little oil is also applied to the blade on the cutting teeth and on the rear of the blade on either side during use.